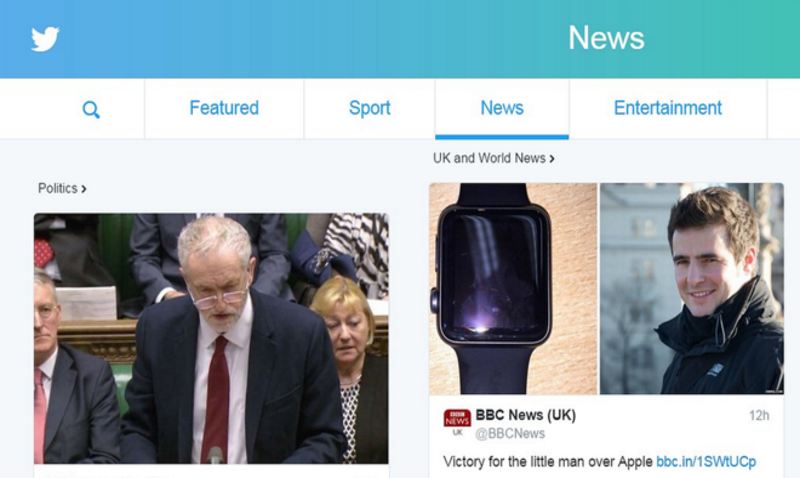 Twitter is rolling out a new homepage designed to engage people who have not logged in to the website. The new page shows real-time updates from celebrities and news websites, and lets people search through tweets. The design was trialled in the US and Japan and will now roll out in a further 21 countries, including the UK. One analyst said the company was trying to widen its appeal, but needed to tackle issues that could put people off using the service. “The old homepage was targeted at getting people to sign up for an account or download the app,” said David Wilkinson, managing partner at digital consultancy Soho Strategy. “This is a bid to expand its appeal beyond the registered users, and get people to engage with content regardless of whether they’re signed in. Twitter has struggled with competition from rivals such as Snapchat and Facebook, and its share price has tumbled since its stock market debut in 2014. The social network currently attracts about 500 million visitors every month, but has only 320 million registered members. The redesigned homepage, which will roll out on the Twitter website and mobile site, draws in live updates from some of the website’s most prolific tweeters. “Starting today, anyone can explore and discover different topics and stories as they occur, including some that are tailored just for you based on your location,” the company said in a statement. Previously, the website’s homepage outside the US and Japan displayed only a large photograph and a log-in panel, without indicating what registered users could do or see on the website. “It shows Twitter’s recognition that an algorithmic way of curating content, like on Facebook, is something that might interest people,” said Mr Wilkinson. “It’s still a huge platform for brands and celebrities to communicate with the public, and they can now reach a larger audience outside of those who follow them.